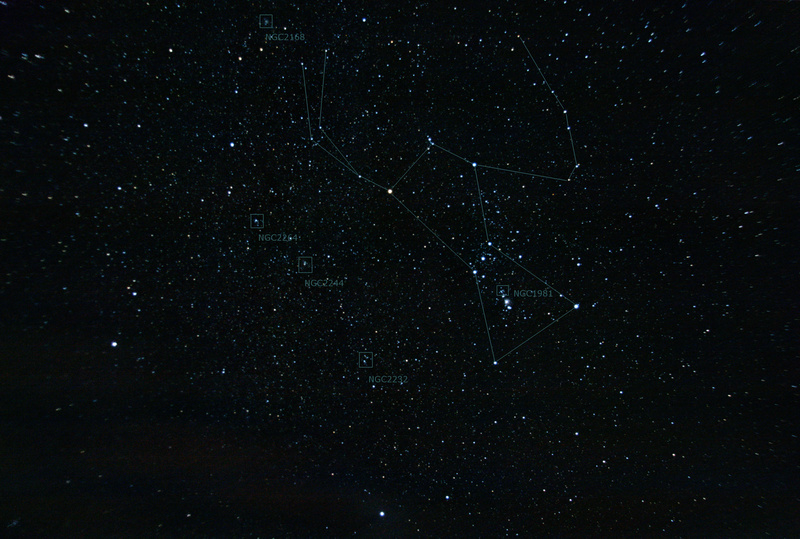 Winter is upon us, and with that comes a popular winter constellation: Orion (the Hunter). Easy to spot and offering lots of fine targets nearby for all types of observation and photography. Orion contains some of the brightest stars in the sky and an easily recognizable shape it’s quick to spot even in the city making for a great evening starting point for observations. You don’t need much to enjoy the sky around Orion; binoculars, a camera on a tripod or a small telescope can reveal different objects in the sky. On the photo below [click to enlarge] I’ve identified five open clusters that show up on my photo even with a 17mm lens, hence should be easy targets for all types of equipment. The first in the list is the easiest to locate as it’s sitting just on top of the sword region. 4th magnitude NGC1981 is a small cluster of young blue stars located 40 light years closer to Earth than the Orion nebula. So after spending a few moments on the Orion nebula, don’t forget to also look at this nice open cluster. The next cluster is a little further away, but just as easy to find; move up to the tip of the club and you’ll see NGC2168 also know as Messier 35 in the constellation Gemini. Half a degree south-west is smaller and more compact NCG2158 (not on photo), also worth a look. Compare the size and density of both open clusters. The next three open clusters are located in the constellation Monoceros and run a line parallel to Orion: NGC2264, NGC2244 and NGC2232. The first two also make great photography targets because of their nebula offering rich texture and color. They are called the Cone and the Rosette nebula respectively. A camera without IR filter will probably be required to correctly capture them as they have strong H-alpha emissions. As open clusters are often young stars, they are still dispersing their original source of hydrogen and other material from the giant molecular cloud from which they were born. So why the open cluster aspect may not be “interesting” from a photography point of view their active and illuminated molecular cloud are often considering. This entry was posted in Chart, Photo and tagged Astronomy, Astrophoto, Astrophotography, Open Cluster, Orion by Benoit Guertin. Bookmark the permalink.